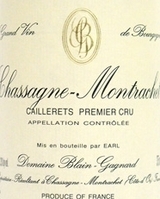 Concentrated, low yield wines in limited production. Essential burgundies for those who like rich but subtle wines. A mix of herbs and mineral shades the peach, apple and lemon flavors in this well-defined white. The creamy texture is offset by brisk acidity. Citrus and mineral notes mark the aftertaste. Best from 2015 through 2022. 60 cases imported.